2) An alloy contains14 parts of tin and 100 parts of copper. What is the percentage of tin in the alloy ? 3) A 20 liter mixture contains 30% alcohol and 70% water. If 5 liters of water is added to the mixture, what will be the percentage of alcohol in the new mixture ? After adding 5 liters of water, the mixture contains (14+5) 19 liters of water and 6 liters of alcohol. 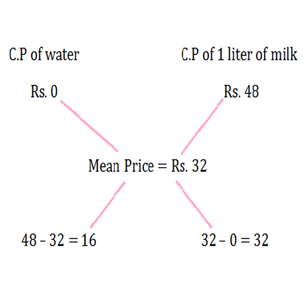 4) In what ratio water must be mixed with milk costing Rs. 48 per liter to get a mixture worth Rs. 32 per liter ? 5) A shopkeeper mixes 60 kg of sugar worth Rs. 30 per kg with 90 kg of sugar worth Rs. 40 per kg. At what rate he must sell the mixture to gain 20%?